Do you design your own marketing materials, but wish they looked more professional? In this video, you’re going to learn some great tips and tricks to make your home-made marketing materials look high end. I interview Pamela Wilson. She is an award-winning graphic designer and marketing consultant who has helped small businesses and large organizations create “big brands” since 1987. In 2010, she founded Big Brand System to show small business owners how a system of strategic marketing and great design makes them look professional, cohesive and successful. She believes that your business may be small, but your brand can be BIG. Pamela is now Executive Vice President of Educational Content at Copyblogger Media, where she helps people build a strong presence on the web. 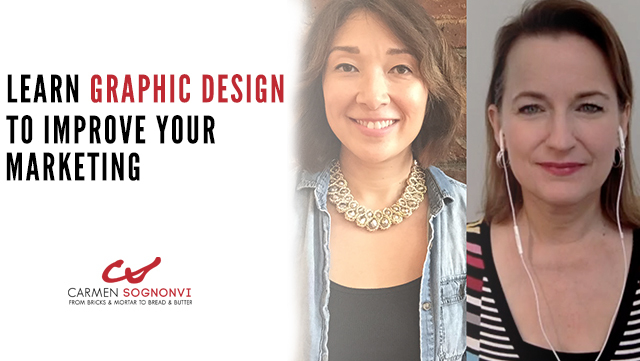 Do you design your own marketing material, but wish they could look more professional? Hi. I am Carmen Sognonvi. In this video, you are going to learn some tips and tricks for helping to make your marketing material that are homemade look high-end. By the way, if you want to get the 7 tools I rely on for marketing in my business, head on over to CarmenSognonvi.com/tools. I’ll cover everything from graphic to design and printing, and I’ll even show you an app that we use where you can track how your fliers are actually distributed. In this video, I interview Pamela Wilson. Let me tell you a little more about Pamela. She is an award-winning graphic designer and marketing consultant who has helped small businesses and large organizations build big brands since 1987. In 2010, she founded Big Brand System to show small business owners how a system of strategic marketing and great design makes them look professional, cohesive and successful. She believes that you business may be small, but your brand can be big. Pamela is now Executive Vice-President of educational content at Copy Blogger Media, where she helps people build a strong presence on the web. Without further ado, here’s is my interview with Pamela. C: Hi Pamela! Thanks for joining me today. P: Hi Carmen! I’m so glad to be here. C: Great, so what we wanted to bring you on today to talk about is design tips. So, A lot of small business owners obviously don’t have large budgets so they are doing their own graphic design, so maybe making their own fliers, posters, maybe even building simple websites, designing emails. C: And so, what I would really love to get from you, since you are really an expert in this area, is what are some — well let’s start with — What are the top mistakes you would say that you see business owners making when it comes to graphic design? That is making their design look not as professional or as compelling as it could be. P: Right, it’s such a great question and there is an answer to it that may not be what people are expecting, but I would say that the biggest mistake I see is a lack of consistency. P: And what happens is all of their materials looks different and there is no consistency between them. So the market that is trying to understand who their business is and trying to get a handle on their brand doesn’t have anything to hold onto to. There is nothing consistent that they see across time. P: So that, to kinda morph into the next question, I know you wanted to know about simple ways to brand and things that are inexpensive. It’s basically that, picking a couple of fonts, a couple of colors that you decide to associate with your brand and using those very consistently over time and it takes a lot of discipline. It’s not easy. C: Yes, style guides. Right. It will be, you know, exactly, we only use these two colors primarily and these will be the secondary colors. We only use this font. Headers look like this, subheads look like this. So basically things are spelled outs so that’s when you look at material from big companies it has that consistency that you are talking about, right? P: And we end up going after these things that take us off brand. It takes you off brand. It’s like outside of this brand language you’ve developed, it just doesn’t look consistent. So, the reason that’s bad, it’s not because we have to be strict; it’s also because our market is being bombarded with messages a marketing messages all day long from the time they get up to the time they go to sleep. P: So, if you want any chance in making a dent, an impression with your brand, you need to be very consistent with the way you deliver that message every single time it’s delivered. Because if you do that over time, if you are consistent, then you have a chance that something to happen like for instance, Coca-Cola. When you see that Coca-Cola red with those white letters, you know, even if you couldn’t make out the letters, you would know it was Coca-Cola. And if you see a truck and it’s brown with gold on it, you know that’s UPS, you just know it, you know? P: And that comes from using those branding elements consistently overtime. C: Great, and so, um, what are some tips that you could share with our audience to make their graphic design look more professional? So, even if they are doing it themselves, complete DIY, what are some simple things they can keep in mind to make just make it look that much more professional? P: And then your big decision is how large I’m going to use it or how bold I’ll use it. The same thing with colors. Doing that alone is going to make it a lot more professional. On top of that, one of the biggest mistakes that people make who don’t have design training try to cram a lot of information into any space. P: Think about a letter size piece of paper. Somebody who doesn’t have design training tends to put the headline close to the top of the paper, maybe it’s half an inch away from the border of the paper – Um- and then they run the text, also, maybe 1/2 inch from the border of the paper, which is kinda the default margin that most of the program give you. Right? C: Would that also apply with the space between the lines of text? P: Somewhat. There is a delicate balance when it comes to that. One of the things you want to do is you want related text to stick together. That’s the highly technical term for what we call it. [laughter] You don’t want to space your lines out so much that you are having to visually hop from line to line to be able to follow them. So, if you have a paragraph of text, you want to have it relatively compact so people see it as one element, if that makes sense. P: They see your headline as an element. They see your body text as a separate element. And it’s kinda hanging together visually. So you don’t want to spread it out too much. It’s a little different on the web. So, if you are doing it for a website, typically line spacing on a website is a little looser. It’s just a little more open than what you would use in print for like a flier or brochure. C: Speaking of this phenomenon of trying to pack too much information into one piece, it seems to me a lot of that also comes down to not being super clear on the goal of what that particular piece is supposed to do. For example, I know a lot of people in my audience send me their fliers to critic, and very often they are trying to cram all their products and services they offer, their story all into one piece, and often I’ll tell them, you know, it’s – the only purpose of the flier is to do one thing, so maybe you want them to visit this page on your website or call your phone number. Once they have made contact, then rely that information. Um – so what are some – are there any tips you can share when it comes to when it comes to what is the purpose of each piece? P: That is a fantastic tip. You can’t ask your one flier to take on the entire burden of marketing your whole business. It’s like too much for that little flier. It usually works better if you think about your marketing as a journey that you are taking your customer along. And usually no single piece of your marketing is going to take them across the whole journey. It’s like this piece is a step, and this piece will move them onto the next place and this piece moves them to the next place. P: If you think about it that way, you truly can drill down and think, when they are in this part of the journey, what is the one thing to do that will move them to the next part of the journey, and you just, it’s more like stepping stones. You just try to move them along those stepping stones with your different marketing pieces rather than asking one single marketing piece to do the whole job. P: For example, the way that would play out on a website is you may have a homepage that people land on, so they land on your homepage, and you have various stepping stones on your homepage where they can then move to a further point on their customer journey. So if they are interested in a specific part of your business, you try to move them to a page on the site that talks about that part of your business. So no single page is doing your entire marketing job. You are just kinda moving them to the next point. Does that make sense? C: Yes, I love that analogy of stepping stones. Of course, you’re a designer so you made it very visual. I think that can help people visual that you go from this stone to the next stone to the next stone. And all along the way, you want to have a really singular focus. C: Let’s talk about photos. If you are a small business owner, very often you are relying on stock photography. I definitely encourage people, as early as you can to try and get your own photos taken. These days there’s many inexpensive way to do this with so many aspiring photographers out there. But let’s say you don’t have that in place yet, and you are really relying on stock photography. What are some tips you have for picking good photos? As we all know, there’s a lot of terrible, terrible stock photography out there. P: Yeah. There is a lot of terrible stock photography. There are a couple of things that I tell people to avoid. One thing is, photography usually works better if the people in the photo look like the type of customer you are trying to attract. So you might have a business where all your customers look like professional models, but most of us don’t, so it’s possible that all of your customers are perfectly groomed and wearing little polo shirts – I don’t know – and they just had their hair and makeup done. But most of us don’t have customers that look like that. The first thing to look for is anything that looks like they hired a set of professional models to photograph the. P: You want real people, right? So, if you are trying to get stock photography that looks like your customer, they should be real people. They should have some __ , have some wrinkles. They should look like real, relatable people. Sometimes you see a photo and you are like, oh that’s perfect, but you want to avoid photos were people are overly posed. They just look like they are posing for a photographer. Did you collect a ton of leads at an event and you’re not sure how to follow up with them? 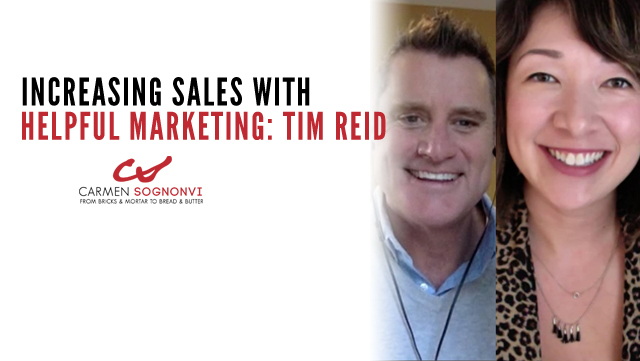 In this video, I explain the best way to do sales follow-up. Did you collect a ton of leads at an event and you’re not sure how to follow up with them? 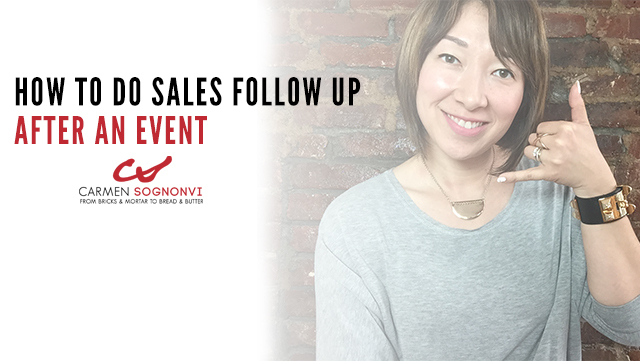 Hi I’m Carmen Sognonvi, keep watching because in this video I will show you the three things you need to do to make sure that you are following up on leads in the right way. By the way, if you would like to get a list of the seven tools I rely on to do all the marketing of my business, head on over to carmensognonvi.com/tools. I will tell you everything from who we use for graphic design and printing and I will also tell you about a mobile app you can use to track your flyer distribution. So you collected tons of leads at an event. So you are feeling pretty good about yourself, but you are not sure what to do next. I have three ideas for you, but before we can even get to those ideas, we need to make sure that you set things up the correct way in the first place. If you haven’t already watched my video on street fairs, be sure to check it out. Because in there I explain why it’s important that you’re not giving out promotional junk at your booth and what you should be doing instead is giving out a free sample or a free trial for that person’s contact information. Ideally you want to be delivering that sample at a later date so that you will have a reason to get back in touch with them. So when you are actually doing the fair, you want to make sure that you have already offered them an irresistible trial or sample. Alright, let’s assume that you did that correctly, what do you do next? Number one is to send a short note that night or the next day. So if you really want to stand apart from all of the other businesses that they met at that event, you want to follow up with them right away. Now this first follow up doesn’t need to be a full on sales pitch. But what it is it’s just a brief note saying hey, it was such a pleasure to meet you today or yesterday at blah blah blah event. I just want to let you know that I am going to be in touch with you in a few days to deliver you the sample or the giveaway. And in the mean time here is a link to our website where you can learn more about XYZ product or service that you offer. So what we actually do in my business is I have this all set up in our CRM system. So we use Infusionsoft and it’s really easy in Infusionsoft to create a web form, an internal webform, that just has name, first name, last name, email address and phone number. When we come back from the fair I have my staff enter all of that data using that internal webform and then I have programmed that webform to automatically send out a text message and an email message to that lead as soon as they hit enter. And so that way, on our end, it’s not us typing out all of these emails, it’s literally just filling out some information into a form and then hitting submit and immediately that person gets a text and an email. So if you can implement a similar system, that will allow you to do this much more efficiently. Number two, add them to your email newsletter list. So when you are actually at the event and you have them filling out their contact information on their form, be sure that that form actually has a little line that indicates that by putting their information on this form, they are agreeing to receive your email newsletter, because that way you are securing permission from them. But it’s really important that in addition to doing sort of one-on-one follow up with leads, you are also adding them to whatever long term nurture sequence you have in place for those leads. So in our case we do a weekly email newsletter. I would encourage you to do the same if you are not already doing that. And so even if we totally drop the ball and do nothing else, I know that at the very least they are subscribed to our weekly email newsletter. So you want to make sure that at the time you are entering these leads into your database, they are also automatically subscribed to your long term nurture sequence or your weekly email newsletter. Those are kind of the same thing in the business that you are in. Number three, call to fulfill the sample or trial. If you set things up in the way that I described where you are capturing the people’s contact information in exchange for the trial or sample, then now you actually have a reason to follow up other than just hey, buy something from me. Right? Because you have made them a promise, hey I’m going to give you a free sample or trial in exchange for your contact information and now the reason you are calling them is to actually fulfill that trial or sample. So in the case of our business, whenever we do a street fair, we give away two free weeks of karate or kickboxing classes. So when we, after we enter the information into our system and they got their little note, hey it’s great meeting you. Here is some information about our programs. They also get automatically entered into our newsletter. Over the course of the next couple of days we could actually take our time and calling each person and making an appointment for them to take their first free class. So, you’ll find that when you collect leads at an event like this, not everyone is going to actually take you up on your offer. And it may seem a little weird to you because you are like, wait, I’m giving away free stuff. This is awesome. But sometimes people just aren’t ready to take advantage of it. So don’t be surprised if you only get like say one out of ten people taking advantage of it right away. It’s totally normal. And the beautiful thing is because you already entered that person into your long term nurture system, they are going to be hearing from you. You are going to be given the opportunity now to develop that relationship. And I can tell you that in our business it’s very often happens that people have been on our list one year, two years or maybe even three years after we meet them at an event and it’s actually at that point that they come in and sign up for a program. So don’t be alarmed if you aren’t converting all of these leads into customers right away, even into trials right away because sometimes people just aren’t ready to take advantage of it yet. It doesn’t mean you are doing something wrong. So how many times should you follow up? I would say that you should follow up at least three times to offer them the free sample or trial that you talked about at the event. So you want to reach out at least three times to fulfill that sample. If they are not responsive after three times, give them a little rest. It’s totally fine because know that your long term nurture sequence or your weekly email newsletter is going to take care of building that relationship with the clients so that when they are ready to purchase, they are going to think of you first. All right. If you found this video useful, be sure to sign up to get email updates from me. You just have to go to carmensognonvi.com/newsletter and sign up there. And if you have a question you would like answered in a future video, just send your question to infor@carmensognonvi.com. Okay, it’s time for some shout outs. We are doing some Instagram additions. I want to shout out to Loretta Williams Gornell, Carlos A. Ponte Jr. and Hustle Management. I have added their profiles below, so be sure to check them out. They are all people doing cool things and to the rest of you, thank you for watching. Do you feel stuck in your business? Have you hit a plateau and you can’t seem to turn things around? Then check out my interview with Brian Young, founder of Home Painters Toronto. Brian overcame 15 straight years of decline in his business to triple his revenues in the last three years. And what did it take for that to happen? Getting punched in the face by a customer. Keep watching to find out more. Do you feel stuck in your business? 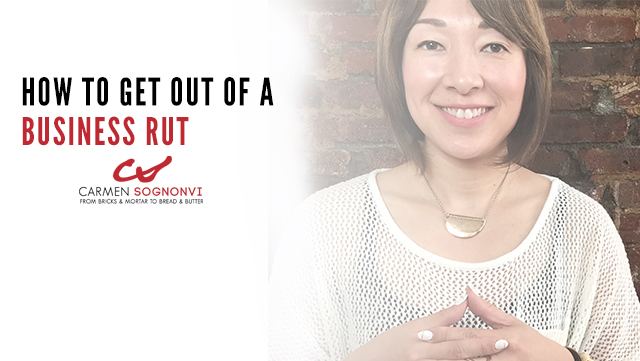 Have you hit a plateau and you feel like you just can’t turn things around? Hi, Iím Carmen Sognonvi. Keep watching because in this video because Iím going to interview Brian Young. Brian Young is a home painter who experienced 15 consecutive years of declining sales. He finally turned things around and in the last three years heís tripled hi revenues.And what did it take for all that to happen? Getting punched in the face by a customer. Thatís right. Keep watching to find out his story. By the way, if you would like to get a list of all the marketing tools I use to run all the marketing in my business head over to carmensognonvi.com/tools. Iíll share with you everything from who we use to graphic design and printing, and Iíll also tell you about a mobile app you can use to track flier distribution. So let me tell you a little about Brian Young. Iím gonna read to you his bio: ìHe owns Home Painters Toronto, which is one of the most successful residential and commercial full service painting companies in the Greater Toronto Area. Since 2012 Brian has grown his companyís revenue by 350%. Heís expanded his team to include 8 full-time employees, 25 sub-contractors, and heís reduced his work week from 80 hours to 65 hours. Heís frequently featured on Breakfast Television TV 44 24hr Makeover Show in Toronto and is an active volunteer and supporter of many local charities. So I actually met Brian at Icon, which is the user conference of InfusionSoft and Brian at the conference won the ìSmall Business Icon of the Year Awardî , which is basically the highest award you could win at Icon, and I was so inspired and moved by his story that I really wanted to share it with all of you. So without further ado, here is my interview with Brian Young. CS: Alright Brian, thank you so much for joining me today. BY: Thank you very much. Great to have you. CS:So, Brian, I was lucky enough to see your awesome presentation at Icon, which is the InfusionSoft user conference. You really shared the story of what your business was like before and this big transformation you made and the amazing results youíre seeing now. So could you share with our viewers what was your before story? What did your business look like in the old days? BY:Sure. Well, I started back in the University student back in 1987 and then I basically went out on my own after I graduated, which was 1991, and back then there was no internet, no cellphones, we used pagers pretty much as a way of communicating, and pretty much my main means of marketing was cold calling, flyer distribution, hung signs; so it was kind of old school that way. Absolutely no technology involved. And then thingsíve taken off since then and pretty much things were pretty much marketing wise the same right about ëtil 2000, 1998-2000, and thatís when the internet took over my business in terms of how clients started finding their painters and my old school marketing was slowly being phased out over time, and that was kind of the beginning of how things eventually had to change for me. CS: And can you talk about what the business results were like? So, kind of like sales-wise, what does numbers look like. BY: Yeah, so before, like back in 1987. Well, pretty much going up to 1997 things were going pretty strong, steadily increasing my business and then as I said, from 1997 to 2011 things were going down slowly. Itís hard to say. I canít even remember the sales back then, they were somewhere around the 3 to 5 hundred thousand dollar range [$300,000-$500,000], but things were staggering. Like I had to work twice as hard to get my business and I could just feel the market not cooperating with me, even though I was trying every way to make it cooperate with me, it was not. And then right about up to 2012 things were, I think, around $375,000 in revenue, and then in the past 3 years since, of course, adapting internet and getting a website, and adopting these new marketing methods, technology related mostly, weíve been able to triple, more than 350% increase in revenue in the last few years. CS: Wow, thatís amazing. So, just to kind of put it in perspective for people you essentially had for 15 years a steady decline. Is that safe to say? BY: Exactly. Very safe to say. In fact, it was steady decline and what was even worse was: I had to work two to three times harder to maintain what was I was even having. CS: So what was your work week like? BY: I was always a workaholic, since being a kid, but I mean what would happen was: Iíd have to work a lot harder in that time to and then even longer. Pretty much, 60 would be a really slow week, and 90 would be a busy week. CS: Weíre talking about hours per week? BY: Hours, yes. So 60 to 90 hours a week. So yeah, a slow season would be 60 hours a week and our busy season I could work as many as 90. So, it was pretty crazy, yeah. And the bad thing about it was the harder I was working to maintain those sales, or even like keep, even though they were going down, it was just more and more work done to get that one sale, so I knew something wasnít working and the problem was I was just too stubborn to change and I didnít like the idea of adopting new methods of marketing, it was just all foreign to me so. You know Iím a technology guy to the point where I would call people or text people, but I would never want to use it for my business. CS: Yeah. And so tell us what changed. I know that there was one pivotal moment that made you rethink everything. So tell us that story. BY: Yeah. I was always under the assumption growing up that the harder you work the more luck you would get and the better things would happen and that was kind of, I was still working super hard to get those sales, and then right up 2011 even though things were going down, a customer, basically I was canvasing a neighborhood and the client was upset ëcause I knocked on his door around dinner time and he shoved me and punched me in the face ëcause he was really offended that I was interrupting his dinner, and that was pretty much the time in my life were I said: ìYou know what? I canít keep doing this, this is just crazyî, and I had to change things. CS: Wow, so you got punched in the face? CS: Yeah, youíre not on the rink. So tell us about what are some of the changes that you implemented then and was it kind of in one swoop or did you take little steps? Because I just really wanted to share your story with my audience because I know that there are so many business owners that can relate. Theyíve been either stuck at this plateau or theyíve been experiencing the steady decline, and itís not that theyíre not working, theyíre working harder than ever before like you talked about, youíre working twice as much just to maintain that same level or lower level of sales, and they are trying different things. I know a lot of business owners, they are open minded, theyíre trying different things, theyíre trying a little bit of social media, theyíre trying some paper click stuff, but it still isnít quite coming together. So what, after that night or that evening when you got punched in the face, what happened after that? BY: Well, the first thing with change is like, you can have all the different methods in the world, but really itís more of a psychological change so you have to like just accept that : ìOk, Iím definitely wrong, doing something wrong here and I have to find it mentally before I start all these changes. Just adopt the idea, have an open mind and say: ìOK, now I have to be open to all these new things, even though Iím scared of them and Iíve never used any of them.î So, thatís the first thing: getting over the mental challenge of just realizing that youíre doing something wrong, admitting it and then changing. So what was your second question? CS: Yeah, what were the steps that you took? BY: Yeah, specifically, I got a business coach, because like I said I was completely foreign to technology and, in terms of how I would use it for my business, and I knew other people were doing it but I had no idea. Like, I heard of like, obviously, websites I heard, but I had no idea of how Iíd market it, of how to implement this into something that would be revenue increasing. Paper-Click, I kind of heard of it, but again, all this stuff was foreign to me, so I got a coach, which was the first thing I did and that really helped a lot. Although, when youíre first changing all these things thereís like I said a big mental hurdle: ìwhy do I have to do that? Why do I have to this? Why do I have to do that? So, there was a huge mental change to get over the belief that these things can be done and these things can change my business. So, that was huge and it took me pretty much almost six months before I could start accepting that these things can work. But once it started working, like the littlest thing, I started getting leads, I didnít have to call anymore, I was like: ìHoly Smokes! This is like unbelievableî I got these leads and I didnít have to ÖOK, so these little winds were what changed things and it kind of changed my belief system as to what was possible and what could happen, what could Internet do for me, what a website could do for me, what Paper Click could do for me, for all these different things and I started believing that it could work. CS: And, Iím curious: what were you getting any resources from within your industry? I know a lot of industries will have their own Trade Associations, or you know, sort of like industry specific consultants or publications. Were you kind of plugged into that, and if so were they talking about any of this stuff? Iím just kind of curious about what that landscape looked like. BY: No, the painting industry is actually a little bit of a dinosaur, somewhat of a dinosaur industry, weíre still a little behind the times. Which actually worked to my advantage ëcause a lot of the industries like the info marketing, itís like obviously leading the way, but if we can apply some of those things that theyíre successful within painting businesses then, I mean, you could go from zero to ten in that much faster. So, depending on the industry in my case most of the painters in my industry were pretty archaic. You could really likeÖ I pretty much in less than 6 months to 9 months, I rose to page one and one of the top, I would say top five to ten painters in Toronto in less than a year. Yeah, and thatís just from those little winds, building on those little winds and then realizing what it could do for me, and then of course having systems like InfusionSoft, Paper Click, having a good SEO organic person working on your SEO, online/offline marketing as well, my on page marketing, as well as joining some amazing review sites such as HomeStars, for me Homestars is our number one lead source. I also had to change the way I was looking at my business, and how I was running my business, because before I was running it not terribly but I wasnít as organized and when youíre online you tend to be exposed to letís say the bigger players, so you have to kind of range your game that way. Which was actually a good thing, I mean, itís good for the customer, good for me and my business and good for the industry in general. CS: Oh thatís interesting. I want to talk a little bit more about that. So, when you said you were online you kind of have to compete a little bit against some of the bigger players so, what did that look like for your market where there are sort of these big chains, corporate companies that were already using some of these marketing methods that you kind of had to go up against, like what did that look like? BY: Yeah. It wasnít too bad. Strauss, like I said was one of the big ones and Iím sure you know for many businesses, some people can be reasonable, some people can be not reasonable, so itís just a matter of upping your game, customer service wise, upping your system so youíd be delivering a better overall experience for the client, like even the smallest little thing, weíre always making little adjustments to make the client experience better. So that was the main thing for painters is the better players in the industry were like, you know, they had a pretty good system and they were like, whereas before I was running a complete nightmare of a system for business. So that was the main thing: customer service was huge, production, pricing, just everything we were just in terms of increasing how our system were for that. CS: Wow, so what Iím kind of hearing from you is that this whole journey started out with frustrations, specifically surrounding marketing, but in reality once you started going down this path it wasnít just about making over the marketing, it was making over the whole business. BY: Yeah, absolutely. Because when youíre offline, when I was offline, you know, I mean, you could almost anything an no oneís going to really: ìWhat are you gonna do? Not use us againî, but when youíre online, everyone know everything and so you have to, everything from the type of pants you wear to the shirt, the logos, how you greet a customer, how you finish a job, the tiniest little thing, you know, people will nitpick at. So you have to find ways to, how do I want to say, to you know, channel every potential problem there is; and which is a good thing because like I said, it ups your game, it makes the customerís experience better, it means you can charge more because youíre doing all these things that other companies arenít and now when, like for my business thereís very few painting companies that can compete with us, the only way they can compete with us is by coming significantly lower than us in price. Are you planning to rent a booth at a street fair or carnival? 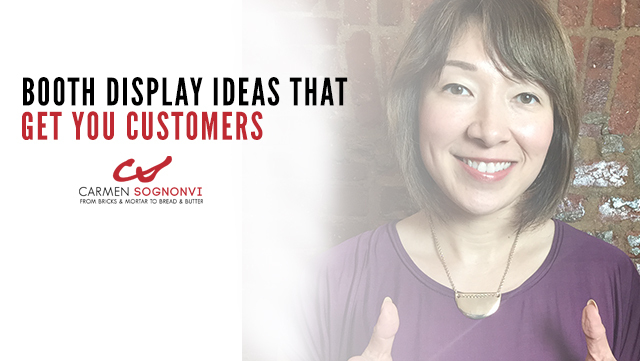 Do you want some booth display ideas that will actually get you customers? In this video I’m going to share with you three ways to make sure your booth generates as many leads as possible for your business. Are you planning to rent a booth at a street fair or a carnival? Are you looking for booth display ideas that will actually bring you customers? Hi, I’m Carmen Sognonvi. Keep watching, ‘cuz in this video I’m gonna share with you three ideas that will actually get people to come to your booth and generate leads for your business. By the way if you want to get a list of the seven tools that I rely on to run all of the marketing in my business, go to carmensognovi.com/tools. I’ll share with you everything from who we use for…for graphic design and printing. And I’ll even tell you about a mobile app that you can use to track your flyer distribution. So if you’re going to be renting a booth at an event, it’s really important that you stay focused on your primary goal. Now remember, your primary goal is not just to get the word out about your business. Your number one goal is to to generate leads for your business. In other words, you want to collect names, email addresses, and phone numbers to add to your customer database and keep in touch with them, so that you can actually follow up and turn those leads into customers. One of the best ways to stand out from your competitors at an event, is to make sure that everyone and everything at the event of yours is branded with your logo. This makes you look instantly much more professional, and it also gives the passersby immediate information about what it is that you do. So, any team members including yourself that are working the event, make sure you guys are all wearing t-shirts or polo shirts that have your logo emblazoned on it. If you have some kind of an offer or a call to action that you can put really big and bold on the back, even better. Don’t just stop at t-shirts. Think about wearing hats as well. If you have a hat and a shirt that are both in bright, matching colors that have your logo on it, that’s really gonna stand out. And then of course, don’t forget about your booth itself. There’s so many opportunities to get your branding out there with your booth. If you have the budget, you can actually get tent covers, and table…sorry, I forgot what they’re called -but sort of table covers customized with your logo. And, if you really want to get fancy, you can actually also get side panels for your tent as well with your logo on there as well. If you’re on a smaller budget, but you still want a branded look, one inexpensive way to do it is by buying a vinyl banner and having that printed and customized with your logo. So, vinyl banners -I usually get ours from esigns.com. They run about….maybe 20, 30 bucks. It’s pretty inexpensive obviously, depending on size. And, um…what we do, is we actually attach the banner to the front of our table using Velcro. And so, it stays on really well, looks nice and clean and professional, but if you’re ever out of Velcro and this has happened to us on occasion, duct tape will do. It’s not as pretty, but sometimes you gotta do what you gotta do. Don’t think that just because you rented a booth you have to stay at that booth at your event. Don’t forget that there are tons of people walking around this event all over the place and only a small portion of them may walk by your booth. Or maybe if they walk by your booth, only a portion of them will actually notice you. So, you want to really take advantage of the entire event. The best way to do this is to keep one person always at the booth, ‘cuz obviously that needs to manned, but then have another person or maybe two or three people walking around the rest of the event with a clipboard. Now remember, they need to be decked out in your branded attire. And they should walk around with a clipboard, going up to people, and letting them know about whatever special offer you’ve got going on that day at the fair. Now, if you’ve watched my other video on why you should should not hand out logo merchandise -I call it the “No Tote Bag Rule” -you’ll know that, um…I always recommend that you have some kind free trial or free offer that you’re giving away at an event like this. So, you have your staff walking around with a clipboard, going up to people, introducing themselves, saying, “Hi, My name is Carmen, I’m from Urban Martial Arts, I just want to let you know that we’re actually giving away two free weeks of classes today. If you’re interested just put down your name, number, and email address.” So, that way you’re not just relying on whatever foot traffic happens to pass by your booth. You’re actually making…uh..taking advantage of the entire event. Don’t be shy about drawing people into your booth by whatever means necessary. So, play loud music at your booth. Umm…have a prize wheel -this is something that actually a lot of martial art schools put to great use. Have a mascot. So, let me talk a little more about those last two things. So, prize wheel. You’ve probably seen those things where you spin it around, makes [makes ticking noise] kind of noise, and people love these things. Plus, it’s really noisy so it gets people to notice your table and see what’s going on. And umm….and basically you have to be very strategic about the prizes that you put on the prize wheel. Because remember, what’s your number one goal at an event? To generate leads. Right? So you want to be capturing names, email addresses, and phone numbers. That’s it. So, the prize that you give away needs to relate back to that. In other words, it shouldn’t be, for example, oh, spin this wheel and if you land on this particular square, then I’m gonna give you this free branded pen. Then they just take the pen and they go away and you haven’t captured their contact info. The prizes need to be trials of your product or service. But, things that you are not going to give them right away. So, in other words, in order for them to claim the prize, they have to give you their contact information. So, be very strategic about it. Think about what would make sense to give away in this kind of a prize wheel situation. But, make sure that it is something that they have to create an exchange with you where they give you their contact information in order for you to deliver this freebie to them. Now one thing that we’ve put to use in the past is having a big mascot at our booth. So, back in the early days when we first started Urban Martial Arts, the first couple years when we did street fairs…um…that was when Kung Fu Panda was really big. I don’t know if you guys remember that movie. But there were no actual Kung Fu Panda costumes available for rent. So what we did is, we kind of hobbled together our own bootleg version. So we basically rented a panda costume. We put a karate uniform top with our logo on the panda and that became our Kung Fu Panda. And so what we would do is we would have this panda walking around, shaking hands with the kids, taking pictures, but one thing that’s really important is, we always had one of our staff members walking with the panda with a clipboard, talking to parents, talking about the two free weeks we were offering, collecting those names and numbers. The one mistake that I see too many businesses do is, you have these cool things, right? You’re giving away balloons, you’re doing face painting, you’ve got mascots. So, you’re providing entertainment for the people at the fair, but you’re not able to generate that entertainment into something that benefits you. Now, if you just want to do that just to kind of be part of the community and to give back, that’s fine, no problem. But, if your primary goal is to generate business for yourself, then you need to be strategic. So, if you’re gonna have a mascot, make sure that you’re then taking all that attention that’s being captured and funnel it into a way to capture all of those leads. If you found this video useful, be sure to sign up to get email updates from me. Just go to carmensognovi.com/newsletter and sign up there. And if you have a question you would like me to answer in a future video, just email it to me at info@carmensognovi.com. Okay, it’s time for some shout outs! And it’s another Instagram edition. If you’re not already following me on Instagram be sure to to. I am @carmensognovi, very easy to find. So, I wanna shout out @JovelleChipriano, @ChampagneToCrayons, @beprismatic, and @MyKeel52. I’ve linked to all of their profiles below. Be sure to check them out and to the people that I shouted out, thank you for your awesome comments on my Instagram posts. I love having you guys follow me there, it’s really fun to have conversations with you guys. And, if you’re not following me on Instagram, make sure that you get started because you’re missing out!